Colombia has lifted the suspension of its bombing campaign against Farc rebels, following the death of at least 10 soldiers in a clash with the left-wing guerrilla group. The military launched a strike against what they call "a strategic Farc rebel position" later on Wednesday, a military source told the BBC. 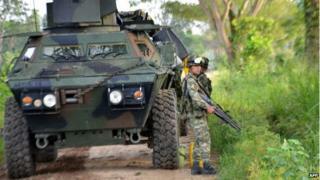 The Colombian government declared a temporary halt to air strikes in March. The two sides have been holding peace talks in Havana, Cuba, since 2012. "I have ordered the armed forces to lift the suspension of air strikes on Farc positions until further notice," President Juan Manuel Santos said on Wednesday. The government says 17 soldiers were also injured, four of them seriously, in the attack in the western province of Cauca, a Farc stronghold. The Farc had declared a unilateral ceasefire declared last December. Analysts describe it as the biggest violation of the current ceasefire. The Farc, the largest of Colombia's rebel groups, was founded in 1964 with the aim of installing a Marxist regime. It is unclear how the latest attack will affect the Havana peace talks, with some arguing it is proof that the Farc cannot be trusted, says BBC Mundo's Arturo Wallace. There are other guerrilla groups in the country that remain in conflict with the government. More than 220,000 people are estimated to have died in five decades of conflict. The Farc is listed as a terrorist organisation by the US and Europe. What is at stake in Colombia's peace process?